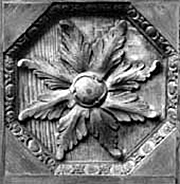 Detail of carving on interior shutter. Hammond-Harwood House, Annapolis, Maryland. Photo: NPS files. A floor plan, the arrangement of spaces, and features and applied finishes may be individually or collectively important in defining the historic character of the building and the purpose for which it was constructed. Thus, their identification, retention, protection, and repair should be given prime consideration in every preservation project. Caution should be exercised in developing plans that would radically change character-defining spaces or that would obscure, damage or destroy interior features or finishes. 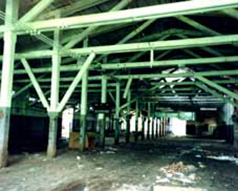 The interiors of mills and industrial buildings are frequently open, unadorned spaces with exposed structural elements. While these spaces can serve many new uses, the floor to ceiling height and exposed truss system are character-defining features that should be retained in rehabilitation. Photo: NPS files. While the exterior of a building may be its most prominent visible aspect, or its "public face," its interior can be even more important in conveying the building's history and development over time. Rehabilitation within the context of the Secretary of the Interior's Standards for Rehabilitation calls for the preservation of exterior and interior portions or features of the building that are significant to its historic, architectural and cultural values. Not only are the features of this early 20th century interior worthy of preservation, the planned sequence of spaces impart a grandeur that is characteristic of high style residences of the period. Photo: Jack E. Boucher, HABS collection. Interior components worthy of preservation may include the building's plan (sequence of spaces and circulation patterns), the building's spaces (rooms and volumes), individual architectural features, and the various finishes and materials that make up the walls, floors, and ceilings. A theater auditorium or sequences of rooms such as double parlors or a lobby leading to a stairway that ascends to a mezzanine may comprise a building's most important spaces. Individual rooms may contain notable features such as plaster cornices, millwork, parquet wood floors, and hardware. Paints, wall coverings, and finishing techniques such as graining, may provide color, texture, and patterns which add to a building's unique character. Virtually all rehabilitations of historic buildings involve some degree of interior alteration, even if the buildings are to be used for their original purpose. Interior rehabilitation proposals may range from preservation of existing features and spaces to total reconfigurations. In some cases, depending on the building, restoration may be warranted to preserve historic character adequately; in other cases, extensive alterations may be perfectly acceptable. This Preservation Brief has been developed to assist building owners and architects in identifying and evaluating those elements of a building's interior that contribute to its historic character and in planning for the preservation of those elements in the process of rehabilitation. The guidance applies to all building types and styles, from 18th century churches to 20th century office buildings. The Brief does not attempt to provide specific advice on preservation techniques and treatments, given the vast range of buildings, but rather suggests general preservation approaches to guide construction work. Before determining what uses might be appropriate and before drawing up plans, a thorough professional assessment should be undertaken to identify those tangible architectural components that, prior to rehabilitation, convey the building's sense of time and place—that is, its "historic character." Such an assessment, accomplished by walking through and taking account of each element that makes up the interior, can help ensure that a truly compatible use for the building, one that requires minimal alteration to the building, is selected. A review of the building's history will reveal why and when the building achieved significance or how it contributes to the significance of the district. This information helps to evaluate whether a particular rehabilitation treatment will be appropriate to the building and whether it will preserve those tangible components of the building that convey its significance for association with specific events or persons along with its architectural importance. In this regard, National Register files may prove useful in explaining why and for what period of time the building is significant. In some cases research may show that later alterations are significant to the building; in other cases, the alterations may be without historical or architectural merit, and may be removed in the rehabilitation. Many institutional buildings possess distinctive spaces or floor plans that are important in conveying the significance of the property. 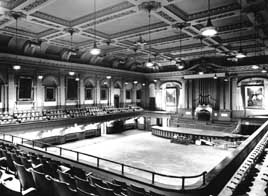 This grand hall, which occupies the entire floor of the building, could not be subdivided without destroying the integrity of the space. Photo: NPS files. Interiors of buildings can be seen as a series of primary and secondary spaces. The goal of the assessment is to identify which elements contribute to the building's character and which do not. Sometimes it will be the sequence and flow of spaces, and not just the individual rooms themselves, that contribute to the building's character. This is particularly evident in buildings that have strong central axes or those that are consciously asymmetrical in design. In other cases, it may be the size or shape of the space that is distinctive. The importance of some interiors may not be readily apparent based on a visual inspection; sometimes rooms that do not appear to be architecturally distinguished are associated with important persons and events that occurred within the building. Primary spaces, are found in all buildings, both monumental and modest. Examples may include foyers, corridors, elevator lobbies, assembly rooms, stairhalls, and parlors. Often they are the places in the building that the public uses and sees; sometimes they are the most architecturally detailed spaces in the building, carefully proportioned and finished with costly materials. They may be functionally and architecturally related to the building's external appearance. In a simpler building, a primary space may be distinguishable only by its location, size, proportions, or use. Primary spaces are always important to the character of the building and should be preserved. The interior of this 19th worker's house has not been properly maintained, but it may be as important historically as a richly ornamented interior. Its wide baseboards, flat window trim, and four-panel door should be carefully preserved in a rehabilitation project. Photo: NPS files. Secondary spaces are generally more utilitarian in appearance and size than primary spaces. They may include areas and rooms that service the building, such as bathrooms, and kitchens. Examples of secondary spaces in a commercial or office structure may include storerooms, service corridors, and in some cases, the offices themselves. Secondary spaces tend to be of less importance to the building and may accept greater change in the course of work without compromising the building's historic character. Spaces are often designed to interrelate both visually and functionally. 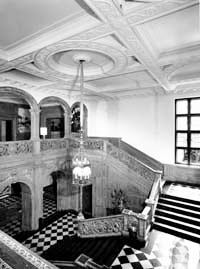 The sequence of spaces, such as vestibule-hall-parlor or foyer-lobby-stair-auditorium or stairhall-corridor-classroom, can define and express the building's historic function and unique character. Important sequences of spaces should be identified and retained in the rehabilitation project. Floor plans may also be distinctive and characteristic of a style of architecture or a region. Examples include Greek Revival and shotgun houses. Floor plans may also reflect social, educational, and medical theories of the period. Many 19th century psychiatric institutions, for example, had plans based on the ideas of Thomas Kirkbride, a Philadelphia doctor who authored a book on asylum design. In addition to evaluating the relative importance of the various spaces, the assessment should identify architectural features and finishes that are part of the interior's history and character. Marble or wood wainscoting in corridors, elevator cabs, crown molding, baseboards, mantels, ceiling medallions, window and door trim, tile and parquet floors, and staircases are among those features that can be found in historic buildings. Architectural finishes of note may include grained woodwork, marbleized columns, and plastered walls. Those features that are characteristic of the building's style and period of construction should, again, be retained in the rehabilitation. Features and finishes, even if machine-made and not exhibiting particularly fine craftsmanship, may be character defining; these would include pressed metal ceilings and millwork around windows and doors. The interior of a plain, simple detailed worker's house of the 19th century may be as important historically as a richly ornamented, high-style townhouse of the same period. Both resources, if equally intact, convey important information about the early inhabitants and deserve the same careful attention to detail in the preservation process. The location and condition of the building's existing heating, plumbing, and electrical systems also need to be noted in the assessment. The visible features of historic systems—radiators, grilles, light fixtures, switchplates, bathtubs, etc.—can contribute to the overall character of the building, even if the systems themselves need upgrading. In assessing a building's interior, it is important to ascertain the extent of alteration and deterioration that may have taken place over the years; these factors help determine what degree of change is appropriate in the project. Close examination of existing fabric and original floorplans, where available, can reveal which alterations have been additive, such as new partitions inserted for functional or structural reasons and historic features covered up rather than destroyed. It can also reveal which have been subtractive, such as key walls removed and architectural features destroyed. If an interior has been modified by additive changes and if these changes have not acquired significance, it may be relatively easy to remove the alterations and return the interior to its historic appearance. If an interior has been greatly altered through subtractive changes, there may be more latitude in making further alterations in the process of rehabilitation because the integrity of the interior has been compromised. At the same time, if the interior had been exceptionally significant, and solid documentation on its historic condition is available, reconstruction of the missing features may be the preferred option. This corridor has glazed walls, oak trim, and marble wainscotting, typical of those found in the late 19th and early 20th century office buildings. 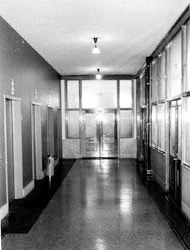 Corridors such as this, displaying simple detailing, should be a priority in rehabilitation projects involving commercial buildings. Photo: NPS files. It is always a recommended practice to photograph interior spaces and features thoroughly prior to rehabilitation. Measured floor plans showing the existing conditions are extremely useful. This documentation is invaluable in drawing up rehabilitation plans and specifications and in assessing the impact of changes to the property for historic preservation certification purposes. If the historic building is to be rehabilitated, it is critical that the new use not require substantial alteration of distinctive spaces or removal of character-defining architectural features or finishes. If an interior loses the physical vestiges of its past as well as its historic function, the sense of time and place associated both with the building and the district in which it is located is lost. The recommended approaches that follow address common problems associated with the rehabilitation of historic interiors and have been adapted from the Secretary of the Interior's Standards for Rehabilitation and Guidelines for Rehabilitating Historic Buildings. Adherence to these suggestions can help ensure that character-defining interior elements are preserved in the process of rehabilitation. The checklist covers a range of situations and is not intended to be all-inclusive. Readers are strongly encouraged to review the full set of guidelines before undertaking any rehabilitation project. 1. Retain and preserve floor plans and interior spaces that are important in defining the overall historic character of the building. This includes the size, configuration, proportion, and relationship of rooms and corridors; the relationship of features to spaces; and the spaces themselves such as lobbies, reception halls, entrance halls, double parlors, theaters, auditoriums, and important industrial or commercial use spaces. Put service functions required by the building's new use, such as bathrooms, mechanical equipment, and office machines, in secondary spaces. 2. Avoid subdividing spaces that are characteristic of a building type or style or that are directly associated with specific persons or patterns of events. Space may be subdivided both vertically through the insertion of new partitions or horizontally through insertion of new floors or mezzanines. The insertion of new additional floors should be considered only when they will not damage or destroy the structural system or obscure, damage, or destroy character-defining spaces, features, or finishes. If rooms have already been subdivided through an earlier insensitive renovation, consider removing the partitions and restoring the room to its original proportions and size. 3. Avoid making new cuts in floors and ceilings where such cuts would change character-defining spaces and the historic configuration of such spaces. Inserting of a new atrium or a lightwell is appropriate only in very limited situations where the existing interiors are not historically or architecturally distinguished. 4. Avoid installing dropped ceilings below ornamental ceilings or in rooms where high ceilings are part of the building's character. In addition to obscuring or destroying significant details, such treatments will also change the space's proportions. If dropped ceilings are installed in buildings that lack character-defining spaces, such as mills and factories, they should be well set back from the windows so they are not visible from the exterior. 5. Retain and preserve interior features and finishes that are important in defining the overall historic character of the building. 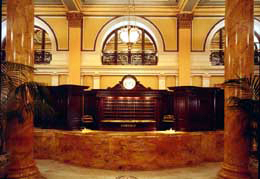 This might include columns, doors, cornices, baseboards, fireplaces and mantels, paneling, light fixtures, elevator cabs, hardware, and flooring; and wallpaper, plaster, paint, and finishes such as stenciling, marbleizing, and graining; and other decorative materials that accent interior features and provide color, texture, and patterning to walls, floors, and ceilings. 6. Retain stairs in their historic configuration and to location. If a second means of egress is required, consider constructing new stairs in secondary spaces. The application of fire-retardant coatings, such as intumescent paints; the installation of fire suppression systems, such as sprinklers; and the construction of glass enclosures can in many cases permit retention of stairs and other character-defining features. 7. Retain and preserve visible features of early mechanical systems that are important in defining the overall historic character of the building, such as radiators, vents, fans, grilles, plumbing fixtures, switchplates, and lights. If new heating, air conditioning, lighting and plumbing systems are installed, they should be done in a way that does not destroy character-defining spaces, features and finishes. Ducts, pipes, and wiring should be installed as inconspicuously as possible: in secondary spaces, in the attic or basement if possible, or in closets. Plaster has been removed from perimeter walls, leaving brick exposed. The plaster should have been retained and repaired, as necessary. Photo: NPS files. 8. Avoid "furring out" perimeter walls for insulation purposes. This requires unnecessary removal of window trim and can change a room's proportions. Consider alternative means of improving thermal performance, such as installing insulation in attics and basements and adding storm windows. 9. Avoid removing paint and plaster from traditionally finished surfaces, to expose masonry and wood. Conversely, avoid painting previously unpainted millwork. Repairing deteriorated plasterwork is encouraged. If the plaster is too deteriorated to save, and the walls and ceilings are not highly ornamented, gypsum board may be an acceptable replacement material. The use of paint colors appropriate to the period of the building's construction is encouraged. 10. Avoid using destructive methods—propane and butane torches or sandblasting—to remove paint or other coatings from historic features. Avoid harsh cleaning agents that can change the appearance of wood. Buildings undergoing rehabilitation must comply with existing building, life safety and fire codes. The application of codes to specific projects varies from building to building, and town to town. Code requirements may make some reuse proposals impractical; in other cases, only minor changes may be needed to bring the project into compliance. In some situations, it may be possible to obtain a code variance to preserve distinctive interior features. (It should be noted that the Secretary's Standards for Rehabilitation take precedence over other regulations and codes in determining whether a rehabilitation project qualifies for Federal tax benefits.) A thorough understanding of the applicable regulations and close coordination with code officials, building inspectors, and fire marshals can prevent the alteration of significant historic interiors. Rehabilitation and restoration work should be undertaken by professionals who have an established reputation in the field. Given the wide range of interior work items, from ornamental plaster repair to marble cleaning and the application of graining, it is possible that a number of specialists and subcontractors will need to be brought in to bring the project to completion. State Historic Preservation Officers and local preservation organizations may be a useful source of information in this regard. Good sources of information on appropriate preservation techniques for specific interior features and finishes include the Bulletin of the Association for Preservation Technology and The Old-House Journal; other useful publications are listed in the bibliography. Architectural features and finishes to be preserved in the process of rehabilitation should be clearly marked on plans and at the site. This step, along with careful supervision of the interior demolition work and protection against arson and vandalism, can prevent the unintended destruction of architectural elements that contribute to the building's historic character. Protective coverings should be installed around architectural features and finishes to avoid damage in the course of construction work and to protect workers. Staircases and floors, in particular, are subjected to dirt and heavy wear, and the risk exists of incurring costly or irreparable damage. In most cases, the best, and least costly, preservation approach is to design and construct a protective system that enables stairs and floors to be used yet protects them from damage. Other architectural features such as mantels, doors, wainscoting, and decorative finishes may be protected by using heavy canvas or plastic sheets. After rehabilitation, this severly deteriorated space was returned to its original elegance. Plaster was repaired and repainted; scagliola colums were restored to match marble; and missing decorative metalwork was re-installed in front of the windows. Photo: Carol M. Highsmith. In many cases, the interior of a historic building is as important as its exterior. The careful identification and evaluation of interior architectural elements, after undertaking research on the building's history and use, is critically important before changes to the building are contemplated. Only after this evaluation should new uses be decided and plans be drawn up. The best rehabilitation is one that preserves and protects those rooms, sequences of spaces, features and finishes that define and shape the overall historic character of the building. This Preservation Brief is based on a discussion paper prepared by the author for a National Park Service regional workshop held in March, 1987, and on a paper written by Gary Hume, "Interior Spaces in Historic Buildings," October, 1987. Appreciation is extended to the staff of Technical Preservation Services Branch and to the staff of NPS regional offices who reviewed the manuscript and provided many useful suggestions. There are few books written exclusively on preserving historic interiors, and most of these tend to focus on residential interiors. Articles on the subject appear regularly in The Old-House Journal, the Bulletin of the Association for Preservation Technology, and Historic Preservation Magazine. Ferro, Maximilian L., and Melissa L. Cook. Electric Wiring and Lighting in Historic American Buildings. New Bedford, Massachusetts: AFC/A Nortek Company, 1984. Fisher, Charles E. "Temporary Protection of Historic Stairways During Rehabilitation Work." Preservation Tech Note. Washington, D.C.: Preservation Assistance Division, National Park Service, U.S. Department of the Interior, 1985. Jennings, Jan, and Herbert Gottfried. American Vernacular Interior Architecture 1870–1940. New York: Van Nostrand Reinhold Company, 1988. Johnson, Ed. Old House Woodwork Restoration: How to Restore Doors, Windows, Walls, Stairs and Decorative Trim to Their Original Beauty. Englewood Cliffs, New Jersey: Prentice-Hall, Inc., 1983. Labine, Clem, and Carolyn Flaherty (editors). The Old-House Journal Compendium. Woodstock, New York: The Overlook Press, 1980. The Secretary of the Interior's Standards for Rehabilitation and Guidelines for Rehabilitating Historic Buildings. Washington, D.C.: Preservation Assistance Division, National Park Service, U.S. Department of the Interior, rev. 1983. U.S. Department of Housing and Urban Development. Rehabilitation Guidelines, volume 111. Washington, D.C.: U.S. Department of Housing and Urban Development, 1980-84. Winkler, Gail Caskey, and Roger W. Moss. Victorian Interior Decoration: American Interiors 1830-1900. New York: Henry Holt and Company, 1986.